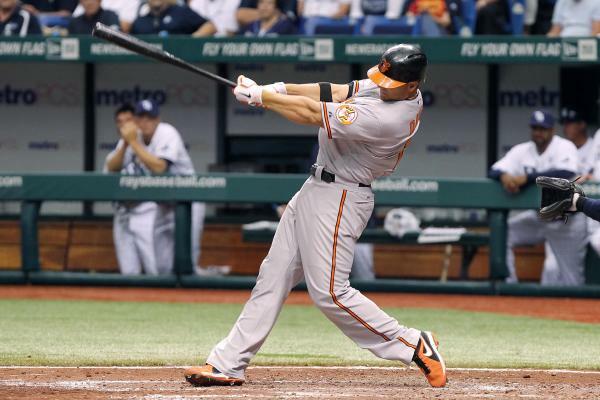 The last installment to the Hitting Backwards: 4 Common Mistakes Hitters Make video series, looks at the swing of 2013 MLB home-run leader Chris Davis. “Being short to the ball” is disastrous to repeatable power. We can be ‘compact’, but ‘swinging down on the ball’ in order to be ‘short to the ball’ is NOT what the best do. Get “on pitch plane” with the barrel as soon as possible is what I tell my hitters to do. When the barrel should accelerate. Some write off what Chris Davis does here as being above average in size and weight, in other words, “he’s just strong and can get away with doing it like this.” I beg to differ…Aaron Miles told me that a downward traveling barrel (to impact) hitter doesn’t last past AA-ball. Rather get hit by a train going 30mph, or motorcycle going 60mph? Potential Energy – made up of his height, weight, joint mobility and stability, bat length and weight. Ball – …it gets on plane early, body to barrel to ball energy transfer is almost complete…Chris Davis finally gets long through contact with his arms (center-fleeing Centrifugal Forces). https://hittingperformancelab.com/wp-content/uploads/2014/04/chris-davis.jpg 400 600 Joey Myers https://hittingperformancelab.com/wp-content/uploads/2018/05/hitting-performance-labs_c90c0362088ef1d3d528f3078f4f8ac1.png Joey Myers2014-04-30 17:55:152018-11-19 05:42:54Chris Davis Video: "Power Move"
Best Hitters Baseball Barrel Path - Do We Have It All Wrong? Adrian Gonzalez: Power Secret You Are Missing? Joey … this video is so dead on, that there’s really nothing left to say – except maybe, as you stated, that by bringing the bat head down at the onset of the swing also un-weights it further, because the player is using gravitational forces as well to get it up to speed. By doing this … a 31 or 32 ounce bat can feel the same as a 23 ounce bat for the hitter. If you drive that bat head straight down, gravity wants to pull it faster, and the player just needs to rotate and pull it through the zone. Excellent observations my man. I agree Bob, yet again! Great observation, forgot about gravity :-). People keep trying to fight gravity by bringing the hands straight to the ball, so they’re fighting gravity in two directions! Horizontally and vertically. As you stated, accelerating the barrel down works with gravitational forces, while also getting an inertial free ride as the barrel turns the “corner” and continues forward onto the pitch plane. Love your work Joey. Got to work on the biceps though. LOL. Davis’s entire swing is flawed and easily fixed , starting with a stance adjustment. He stands too tall in stance, and would benefit from widening his stance and shortening his stride. This will make his strike zone smaller to have to swing into/cover. His head / eyes also would t move/drop which is giving the pitch the appearance of more movement than it actually has! You wouldn’t have the hands dropping as much and barrel dropping along with his arm barring when his shoulder flys open too early.with bat drag! He needs to get hands through zone quicker/inside ball and out front and longer. Miguel Cabrera REVEALS Timing Of Torque Troy Tulowitzki VIDEO: Stride Killing Bat Speed?